The John Smith's Stadium - formerly the Galpharm Stadium - is a versatile sports, leisure and commercial complex located in Huddersfield, West Yorkshire. In November 1991 a unique partnership was formed between Kirklees Metropolitan Council, Huddersfield Town FC and Huddersfield Rugby League Club to create a complex which would be a versatile sports, entertainment and hospitality facility with a commercial theme integrated into the design ...... A Blueprint for others to follow. The focal point of the 51 acre site is the uniquely designed 24,500 seater stadium, which is home to the two sports clubs and was awarded the prestigious RIBA Building of the Year award for 1995. The stadium boasts an impressive range of facilities that are available for use throughout the year. The latest addition to this superb complex is the Panasonic Stand which includes a purpose built Business & Conference Centre, 16 twin bedrooms and a Community Health & Leisure Pod. To the south of the site lies a 30 bay Golf Driving Range with professional teaching facilities and a 1500 sq. ft. Golf Superstore and to the north of the site is a 9 screen cinema with over 2000 seats and associated restaurant/bar facilities. The stadium has received significant funding from a range of commercial and government funding sources. This includes English Sports Council (£5.5m), English Partnerships (£1.66m), Football Trust (£2.75m) and Foundation for Sports and Arts (£1m). Around £2m in sponsorship has been received from Alfred McAlpine Plc, Panasonic and Lawrence Batley OBE, along with significant capital funding from the partnership. At a cost of almost £40 million the stadium complex is rapidly becoming known as one of the major leisure destinations in the north of England. The John Smith's Stadium has created an impressive annual event programme spanning major Rugby Union and Rugby League Internationals, England Under 21 Soccer Internationals and high profile Rock Concerts. Additionally the venue offers superb matchday corporate hospitality packages for both Huddersfield Town FC and Huddersfield Giants Super League Rugby Club. Hospitality Packages are available for up to 1000 guests at all events, most of which can be tailored to your personal requirements. There are 42 luxury Corporate Hospitality Suites each holding 10 people and available for all events, offering unrivalled views of the action. You can be certain that the quality and service will be second to none and the entertainment first class. The Lawrence Batley Stand is the one that many call the main stand. It has two tiers, the main offices for both the Football club and the Rugby club, the ticket office, the player's entrance and the main reception. It also hold the corporate boxes and function hall, plus the trophy room and main boardroom. This stands capacity is 8279 plus the corporate boxes. Opposite the Lawrence Batley Stand is the Kilner Bank Stand. This stand holds 7333 and can usually be found to contain the most noise during games! This stand doesn't really have much to offer apart from the usual food and drink venues, but apparently this is where to go if you want to partake in any singing and chanting. The Panasonic Stand is the newest addition to the McAlpine Stadium. It holds 4888 people in its two tiers and also incorporates a hotel in it! Some other fancy stuff regarding this stand is the fact that it has a retractable stage for any concerts that are held there, now that's impressive! The Travelworld Stand, is known to most supporters as the Away End. It holds 4054, and is the most basic of all the stands. It still has the usual food and drink points, plus it holds the impressive scoreboard. The stadium was known as The Alfred McAlpine Stadium from 1994 to 2004, when the sponsorship deal expired. 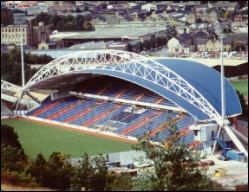 Galpharm then signed a deal to sponsor the stadium till 2012. The current stadium sponsor is John Smith's.